Now that we’ve created a virtual hard disk, we need to format it and mount it so it will act like a physical drive. 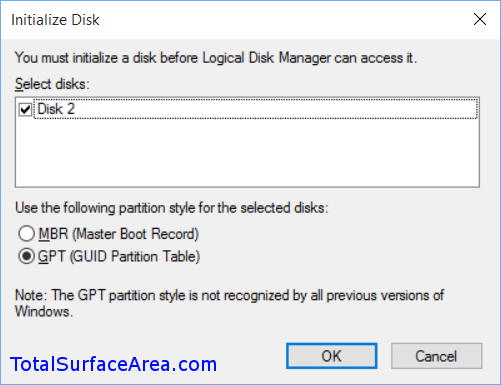 Step 3.1: Right-click on the Start Button and select Disk Management. Step 3.2: In the Disk Management window, right-click on the left side next to the Disk # icon of the virtual hard disk you have just created. Select Initialize Disk. Step 3.3: In the Initialize Disk window, you can leave everything default. The MBR partition style dates back to the early PC era. Selecting MBR is okay, but GPT is more advanced and capable moving forward. Click OK. 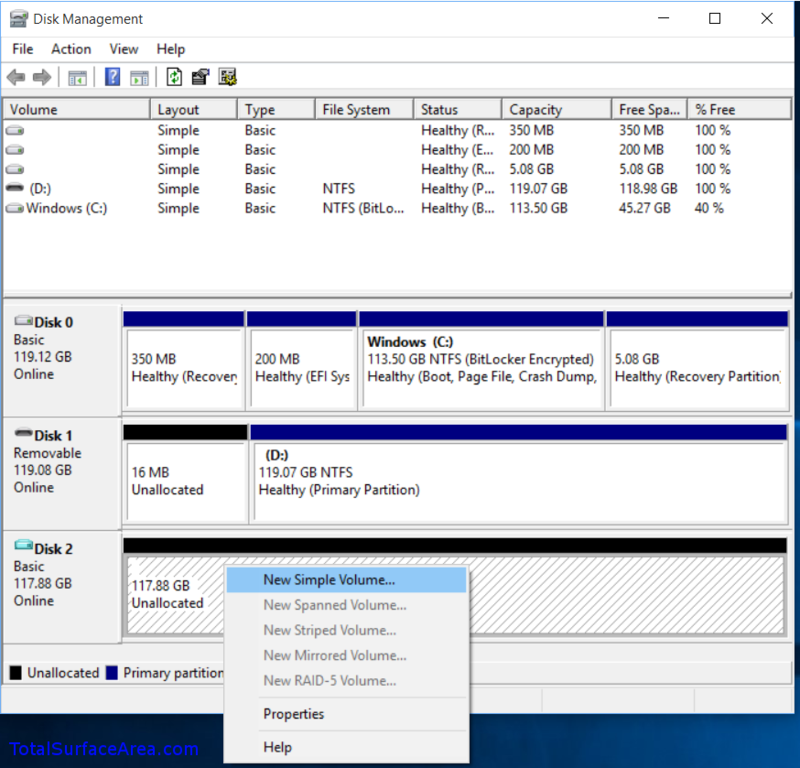 Step 3.4: In the Disk Management window, note that your virtual hard disk is now online. 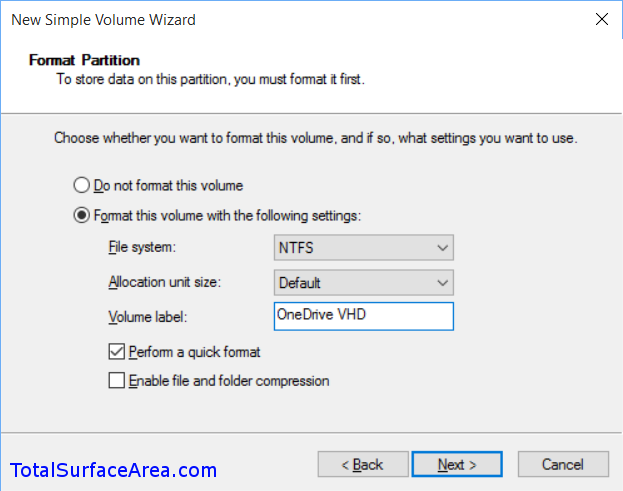 Right-click on the right side of the virtual hard disk where it is Unallocated and select New Simple Volume. 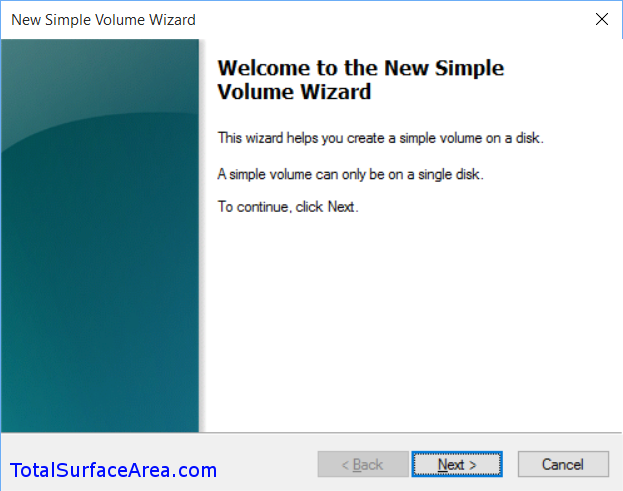 Step 3.5: In the New Simple Volume Wizard window, click Next. 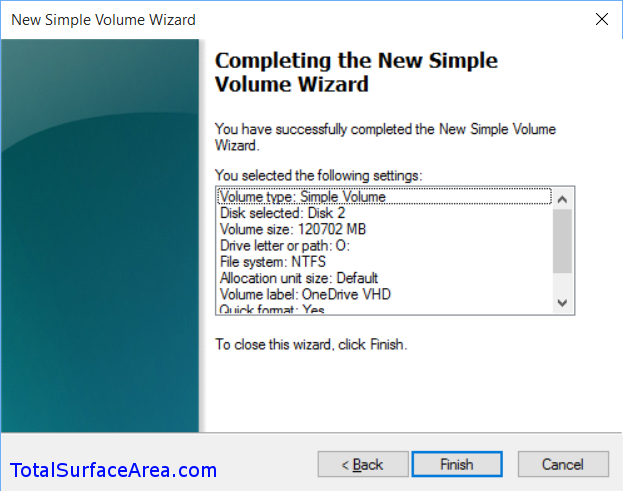 Step 3.6: In the New Simple Volume Wizard window, you can enter a different volume, but we want to use the whole virtual volume, so just leave it at the maximum and click Next. 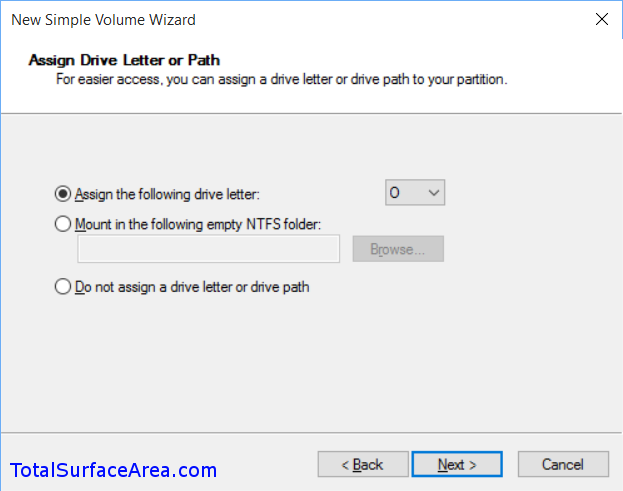 Step 3.7: In the New Simple Volume Wizard window, select “Assign the following drive letter:” and choose a drive letter. You can leave the default drive letter or select a new one. I chose “O” for OneDrive so it doesn’t interfere with the lower drive letters as I use various USB drives and memory cards. Click Next. 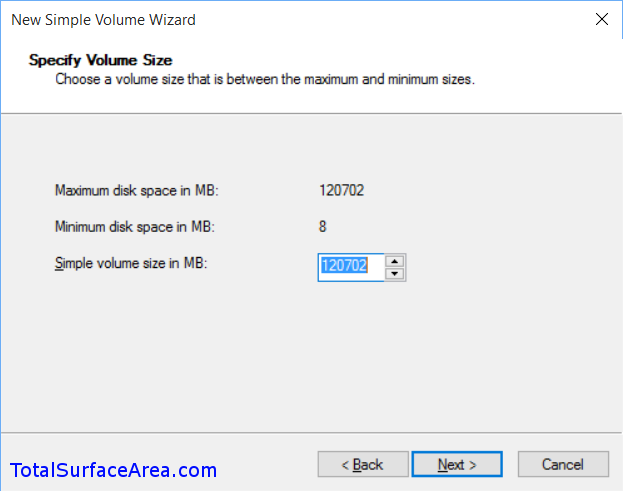 Step 3.8: In the New Simple Volume Wizard window, select “Format this volume with the following settings:” and enter a volume label of your choice. I entered “OneDrive VHD” as my label. Click Next. Step 3.9: In the New Simple Volume Wizard window, click Finish to complete the wizard. Step 3.10: This step is not needed, but it is good to see what we’ve done. In the Disk Management window, you can see your newly mounted and formatted drive. Open File Explorer and select “This PC.” See the new drive? This is the mounted virtual hard disk drive that we will use for our OneDrive folder. 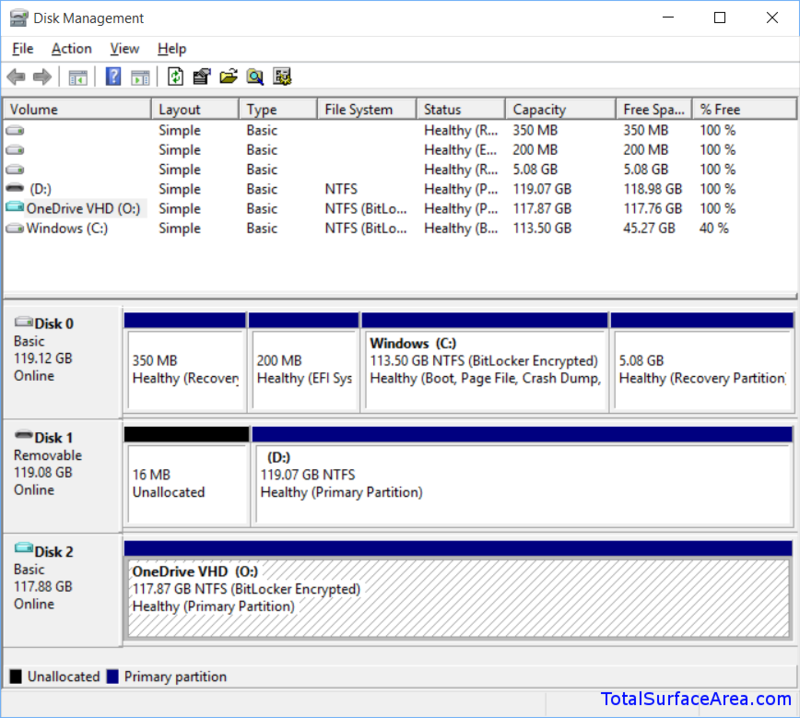 In my example here, it is drive (O:) OneDrive VHD. You can close the File Explorer window. This is really well written and works like a dream. I did hit two hurdles so maybe this will help others. At 4.1 I did not have an option to unlink. I worked out that was because it was in the middle of a sync so i right clicked and paused the sync on the OneDrive icon and then the steps worked very smoothly. The second hurdle was when my computer had reset after an update and I followed the instructions to re-link OneDrive, it was just all wrong but in the end it was simply that my wifi link had dropped out. Good Job and better explain. Thanks a lot. My VHD did not get BitLocker Encryption. Why not?